A place for the unruly – Village Lock-up, Steeple Ashton, Wiltshire | Shortfinals - aviation and more! Castles in the air, and on the ground…..
Shortfinals – aviation and more! A blog about aviation and my crowded life! Contents © Shortfinals and AirShowConsultants; all rights reserved! The Bristol F.2B Fighter – bare! Aviation has taken me to many places – from the wilds of Africa to the forests of Sweden. Once my work with one particular aviation event took me to the sleepy little village of Steeple Ashton in Wiltshire. It hasn’t always been like this; during World War Two, from September, 1942 to January, 1944, this place echoed to the sound of jeeps being driven furiously, and the local pubs would have been packed with off-duty U.S. servicemen. RAF Keevil, next door to the village, had been handed over to the USAAF (as USAAF Station AAF-471), and had been used by the Douglas C-47 and C-53 aircraft of the 62nd Troop Carrier Group, and later the 153rd Observation Squadron equipped with Douglas A-20s and Supermarine Spitfires. In 1944 the RAF moved back in, and without doubt the local population would have missed the lively Yanks. I wonder what those GI’s would have made of this strange structure on the village green? Here you can see the Steeple Ashton Lock-up. This simple structure was designed to hold a miscreant, or possibly two. Dating from when local crime really WAS local they were, at one time, to be found in many out of the way corners of tiny hamlets and villages across England, Scotland and Wales. Lock-ups were useful, in that the local Constable could confine a suspect, be they either a drunk or a suspected thief, until a Justice of the Peace could be found who would hear the facts of the matter, and decide if the person concerned would be let off with a warning, fined or remanded to the next Quarter Sessions, if the offence was serious enough. Generally, if it was just a case of someone who had been drunk and disorderly, they would be let out the following morning, possibly into the not-so-tender arms of their immediate family! This type of confinement had been around since the Middle Ages, when the idea of ‘judges of assize’ became common. These individuals, holding the King’s commission, and under the rule of ‘oyer and terminer’, would travel around the counties of England and Wales, making full enquiries into all misdemeanors and higher crimes, and handing down judgement upon individuals. The lock-ups could vary widely in shape and size, with many having a conical shape (as with the one in Alfriston in East Sussex). Some were simple wooden clapboard or staves (a surviving example being that at Canewdon, Essex) or even brick. There are many made from local finished stone, of course, or even concrete, a building material which has been in use since Roman times. For example, my own ‘home’ county of Derbyshire still has the House of Confinement at Alfreton, with its stone slab roof, two tiny cells and a jailer’s room. This was used to hold prisoners overnight before they were sent south to Derby Jail. 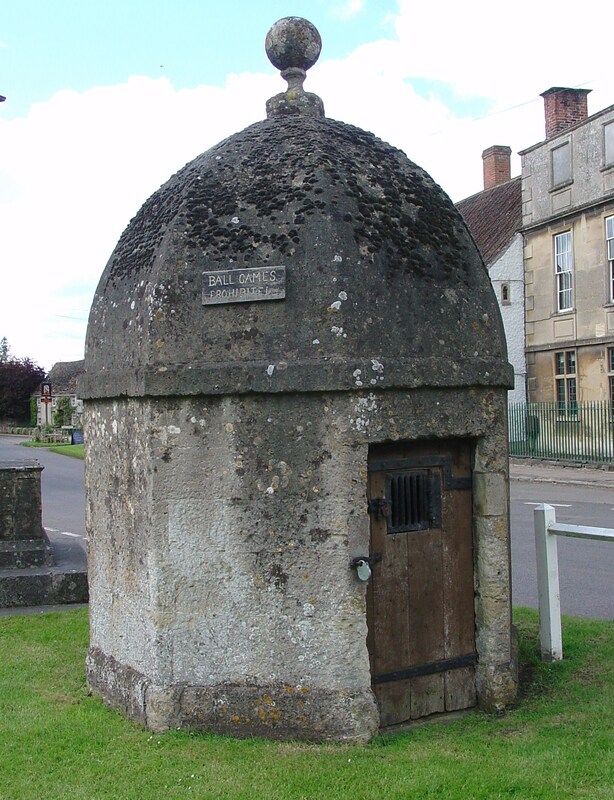 Wiltshire, the county where Steeple Ashton is located, has some very interesting surviving lock-ups; they are located in the communities of Shrewton, Lacock, Hilperton, Trowbridge (four miles from Steeple Ashton) and Box. Many of the survivors have been restored and have also acquired Listed Building status and are, therefore, protected by statute. There is, indeed, a Village Lock-up Association, but that organization appears to be either moribund or just inactive. The Steeple Ashton Lock-up is octagonal, and made from closely-fitting local cut stone; I would say that it is either late Georgian or early Victorian. It has a ‘cup-shaped’ roof, which echoes the shape of many Mediaeval domes and is surmounted by a ball-style finial. The door is of iron-bound wood, with a small, square, barred window – the only source of light; it is secured by a strong padlock. Presumably, in this day and age, this would not be used to secure a prisoner, but to stop vandalism, or prevent anyone from using it as an overnight shelter. The roof is now being colonized by moss, as you can see, and there are at least two different species of lichen growing on the stone, which attests to the good air quality in the village. I was able to identify one of the growths as the Golden Shield Lichen, (Xanthoria parietina), an unusual symbiotic pairing of a flattened, lobed fungus, host to a colony of single cell photosynthetic algae, which are protected by the fungus and provide it with nutrients. X. parietina is common near agricultural land – which tends to have high levels of nitrogen – and Steeple Ashton is a farming community. As you can see, the Lock-up is still undertaking a ‘passive policing function’, in that it now carries a sign -‘Ball Games Prohibited’ ! The English village lock-up – an echo of bygone justice. DONATE to the The People's Mosquito DONATE to help The People’s Mosquito Ltd build a Mosquito! Passiondesavions Excellent blog from a pilot and Air Traffic Controller (en francais). The photography is exceptional. C’est magnifique! The People's Mosquito Ltd Help to launch a de Havilland Mosquito into British skies! An aviation charity with just one aim…. TPM Fund Help us build a Mosqutio for Britain! Travelforaircraft An excellent aircraft miscellany!